STARKVILLE, Miss. -- Many landowners want to make changes in Conservation Reserve Program hardwood plantations because of declining populations of game animals, especially deer. Such changes can be made with approval from the Natural Resources Conservation Service. Wildlife populations change in relation to tree growth. During the hardwood plantation establishment phase, a wide variety of wildlife is abundant, including deer that thrived on the combination of cover plants, grasses and forbs, which are nonwoody, flowering plants. As plantation trees age and develop larger crowns, less sunlight reaches the forest floor, which has a profound negative effect on all understory plant growth. Landowners have observed the impact this change has on deer, and they want to alleviate the situation. If the land is no longer under a CRP contract, landowners have free rein to do whatever they choose, but they should weigh every possible aspect before acting. When moving from agriculture back to forest cover, it is nearly impossible to provide plant diversification that mimics natural stands. 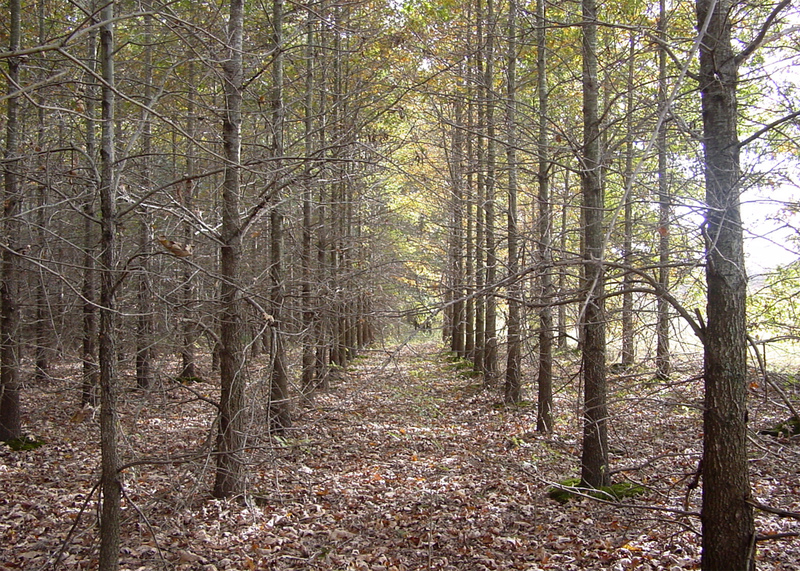 Problems associated with CRP hardwood plantings include both the species mixture and spacing. 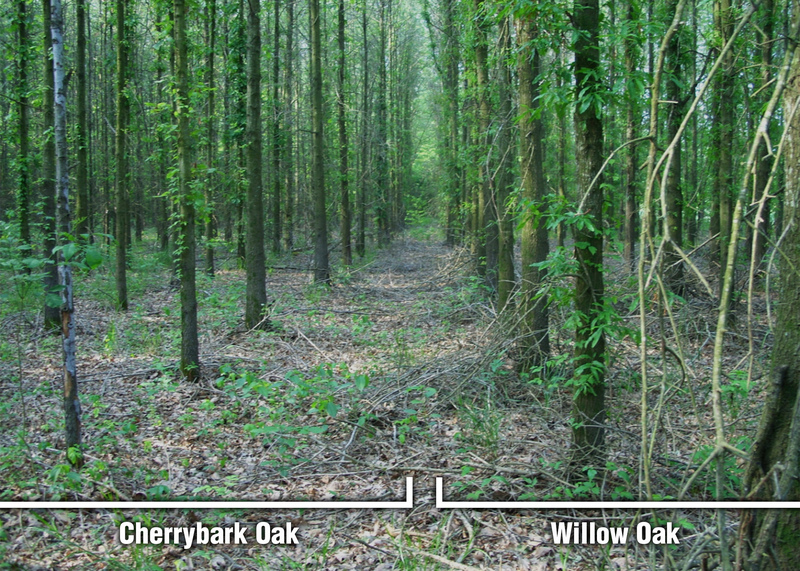 In most cases, these stands are mostly composed of oak species such as Nuttall, willow and/or water oak, which will survive and grow best on poorly drained soils. The result has been plantations with similar development rates, significantly delayed acorn production, longer periods when all the trees are about the same height and size, and a longer period of time when sunlight is primarily intercepted by the oak crowns. Additionally, the wide tree spacing of about 12 by 12 feet and the elimination of volunteer trees results in larger lower limbs on the first 15 to 20 feet of adult trees. These large, poorly formed limbs not only result in lower quality timber for future marketing, but also take much longer to self-prune. Obviously, the quick remedy is to remove trees and allow more sunlight to reach the soil surface, thus promoting the growth of forbs and grasses. However, it’s not a good idea to remove trees without understanding how the plantation will respond. It probably won’t bring the improvements you want, and it could jeopardize the integrity of the planting. Research has shown that removing single rows will not work, as the trees respond quickly with increased crown expansion. Therefore, the stand will be back in the same situation within a few years. It’s better to wait until the lower limbs self-prune, thus allowing a logger better access to the trees, and making it more likely to get the stand thinned. One alternative is to evaluate the plantation and locate spots where trees may not be growing well or have failed. Areas of poor tree growth and survival provide excellent opportunities for landowners to thin or clear parts of the plantation, which will increase the growth of other plants that provide wildlife food and shelter.